Xuyi Observation Station, which stands 180 meters high above sea level, with longitude 118"28E, latitude 32°44′N, is located at the top of Pao Ma Mountain, Xuyi, the interface of Jiangsu and Anhui province. Xuyi Observation Station is in the center of the Tieshan Temple national forest, which covers an area of about 21 sq. km and the Tianquan lake at the foot of the mountain covers about 9.5 sq. km. As the result of the ancient geological movement, Pao Ma mountain has very unique land form. With a huge flat square located on the top, a great landscape can be seen from there. There are no inhabitants and industry near the Xuyi Observation Station, and thus the condition of light of night sky is very good. 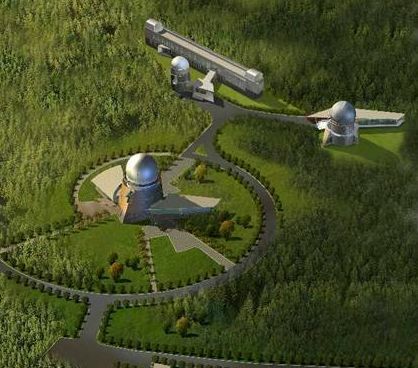 Xuyi Observation Station is the one and only celestial mechanics actual measurement station in China. The major task is the research of dynamics of Small Solar System body and artificial object. Presently, our station has equipped a caliber 105/120 cm near earth object telescopic finder, and a caliber 65/73cm horizontal Space debris surveillance telescope and many other telescopes for multiple usage. Near earth object telescopic finder is the biggest all-purpose Schmidt telescope in China. It has been employed with the best 4K X 4K drift scanning CCD finder. It aims to prevent the threat from asteroid near earth, and start some solar system scientific study. Space debris surveillance telescope is used to search the space rubbish made by human-being in order to serve the secure of spaceflight.